In keeping with the SmartDRY ease-of-use advantage, several enhancements have been integrated to ensure even greater control, security and parts access. For those of you who missed the display of these new features at the recent APEX event, here’s a run-down. ALL SmartDRY Models -- Touch screen control with a new 4.1” full color screen for system management at your fingertips. ALL SmartDRY Models – Secure, keyless entry eliminates non-authorized access and the need to keep up with conventional keys. 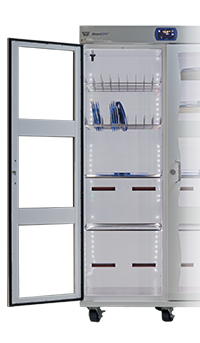 SmartDRY SD-30 and SmartDRY SD-48 Models – Taller doors and open interior have been integrated into the larger SmartDRY systems to ensure large item compatibility. Feeders and trays are easily accessible and component reels can stay joined to feeders for traceability compliance. Of course, these new additions are just that – “and then some” features! SmartDRY continues to deliver on all of the capability and intuitive functionality you’ve come to enjoy – market-leading fast recovery time (<3 minutes), unique status lighting and Industry 4.0 capability. New features and options available May 1st.